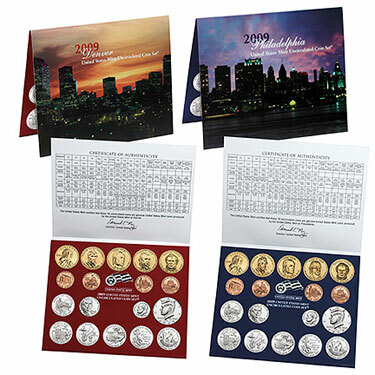 The 2009 United States Mint Set was released by the US Mint on October 1, 2009. The release date was later than typical for this product due to unique tarnish issues encountered by the US Mint for the 2009 Lincoln Cents, which were struck with a special composition. The sets were priced at $27.95 each, which represents an increase of $5 from the price of the prior year set. The number of coins in the 2009 Mint Set was greatly expanded from the prior year, to reach a total of 36 coins. The additional coins were the result of one additional quarter per mint, and three additional cents per mint, both the result of rotating reverse designs. The sets were packaged in two separate folders with the coins sealed under plastic. These folders are placed in a brown cardboard box, which is sealed. The coins contained in the sets feature a special satin finish, which differs from the finish used for circulation strike coins. This finish has been used in government packaged Mint Sets since 2005. Coins are struck on special presses, using greater force than circulating coins. The 2009 Lincoln Cents will feature a special composition. Rather than the zinc based composition used for circulating one cent coins, a composition of 95% copper, 3% zinc, and 2% tin will be used. This is the composition used in 1909 when the Lincoln Cent was first issued. Separately, the United States Mint issued a 2009 Presidential Dollar Uncirculated Coin Set. This set contains uncirculated, satin finish versions of all P & D mint 2009 Presidential Dollars in a custom folder. These sets were priced at $15.95.